If you went to elementary school between 1990-1996, you probably remember playing computer games to enhance your educational experience. 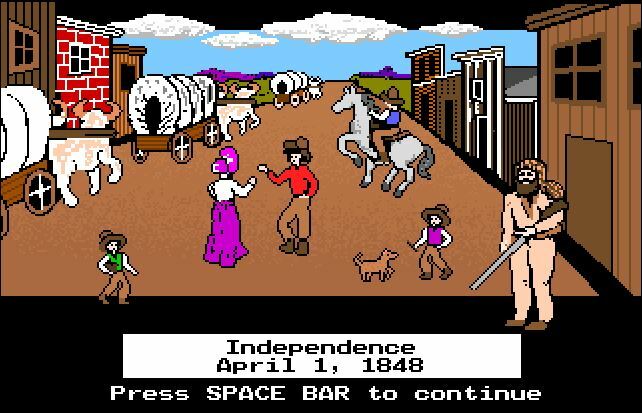 I did… I remember playing Oregon Trail at least once a week, trying my best not to die of dysentery and wondering if I had purchased enough oxen, wishing I could carry more than 3 spare wagon wheels on my journey across the Wild West. We also played relics like Treasure Mountain, Where in the World is Carmen Sandiego, and Number Munchers. Apparently there are a ton of old computer games that have been archived. Thanks to Internet Archives, the Oregon Trail is accessible to students again! As I just played the original Oregon Trail from 1990, I was thrust back in time to my elementary AG class (Yes, I was that kid). Students (or adults at home who are just as excited as I am right now) can now play the original version or the “updated” Deluxe version, along with several other old MS-DOS computer games, Sega Genesis games, and Internet Arcade games. Many titles/games are not appropriate for students, as you can imagine; I would suggest linking to a specific game and not to the library of games that is available. So I’m thinking… how can I bring back this old gem to my students today? Will they be as enamored as I was, or will it look too “old” and pixelated to grab their attention? Luckily for me, this is my last week with my 3rd-5th grade students and I am certainly going to find out. You see, at the end of the school year, I like to give each of my classes the freedom to play board games with their friends for an entire media class (50 minutes). I find playing games builds camaraderie among the students as the year is winding down and the end-of-year-crazy sets in. I also enjoy popping in on games and playing with the students. I set the timer for 10-15 minutes per game and let them play. Most of the games can be completed within 15 minutes. My younger students practice their math skills in Hungry Hippos, Hi-Ho Cherry-O, and Chutes and Ladders. They use strategy in Connect Four and spatial reasoning when solving puzzles. My upper grade students get excited about Apples to Apples, Junior so we usually play that as a class for about 20 minutes before I split them into smaller teams to keep the game going for the remainder of the class. I think this year will be different; I’m thinking this year, we will explore Oregon Trail once again. I am going to resurrect it for my 3rd-5th grade students. Students will be given approximately 30 minutes to “play the game”. As they complete their journey, they will answer some questions for future collaborative discussions. What did you choose to be (banker, farmer, or carpenter) and why? What month did you decide to leave? Why did you choose that month? How much money did you have to spend? What did you buy at the General Store before you left? Did you change your ration throughout the journey? If you did, why? Did you ever stop to rest? Did you stop to speak with the locals? If so, did they help you make decisions? What difficulties do you encounter on your trip? How did you handle those? Did everyone make it to Oregon safely? How many miles did you travel all together? How long did it take you to reach Oregon from your starting point? After playing Oregon Trail, we will then sort into groups based on what the traveler chose to be and compare and contrast journeys. We will put everyone who made it to Oregon with all their party intact together to discuss strategies, as well as taking those who died into a group to discuss preventative measures for the next trip. Finally, students will write a reflection on their journey with details on their journey and if they would change anything on their journey. At the very end of class, I will show students on a map where the real Oregon Trail led and we will discuss similarities and differences between what they experienced and what those on the Trail experienced. I am looking forward to this week in class. Now if you’ll excuse me, I will be playing games… errrr, researching for class.